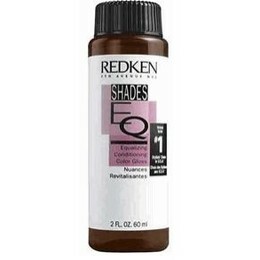 Many salons use this product as a glossing or glazing treatment. I have been using it for, geeze, about 10 years. I rarely use permanent hair color because I don’t have many grays. Let me explain how a demi-permanent hair color works. Think of it like sheer pantyhose, it changes the color of your legs but still takes into consideration your natural color, it uses your natural coloring as a base. Then compare it to opaque pantyhose (permanent hair color), or tights. They completely cover your natural coloring. Make sense now? So, if I use a demi-permanent hair color over my already medium-dark brown hair it will look much darker than if a blond used the same color. Unlike box dyes, in the professional world known as metallic-dyes, when used on a blond the color will not be extra dark, it will be lighter and glossy. This is the reason why stylists love to use Shades EQ as a toner over too light highlights. I highly recommend this product for it’s glossyness and ability to change the color of hair for 6-8 weeks. You must remember it’s not a permanent color so it will fade, but on the bright side, no roots! Search your local Redkin salons to book your next glossying/glazing treatment with Shades EQ!